I Love making the goats milk soap & Thank You to so many people that have told me about some of their amazing results or just how soft their skin is because of my soap I'm hoping to be making it a long time. You can contact me with the info under the Contact page here or go to my business soap page on FB & contact me that way. I have many stores that sell my soap & I am also happy to ship any where in the country for you for a flat rate. I try to always have a very wide selection on hand ready to sell. Some are made with essential oils & the rest I use fragrance oils specific for soap. Many benefits to using goats milk soap & so helpful to so many different types of skin issues as well as for everyday use for all different skin types. 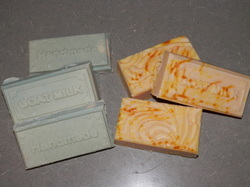 Below is the link to my Facebook soap page with the details of stores that sell it or how to contact me to buy direct. I also keep my scents that I have available updated there & if I have any specials going you'll find it all on my FB soap page under Udderly Precious Soaps and Thanks so much for looking. Listed on my Business FaceBook Page is a list of all the stores that carry my products & of course if your not close to any of the stores you can always contact me & get it directly from me. I also make up a Goats Milk Hand & Body cream. It is listed on my FB page. You can get it in a 4 ounce or 8 ounce jar.